Back again I'm on a roll today. this is my 2nd challenge today, another sketch to follow this blog challenges you to use new or neglected stash. I used my new Dandelion stamp it is the first time its been inked, again he's been coloured with my new prisma pencils. He looks so adorable Shell, I love the colour combination you've used for him. Thanks for joining in with Sketch & Stash! 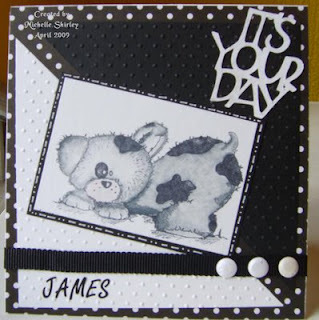 Very cute card and super monochrome combo. Gorgeous card Shell and I love how you've coloured the image, looks so effective!! Great card. I love the black and white and the image is adorable. Fab card Shell. I love your take on the sketch and the image is so cute. great colour scheme too.